Camping, like Paris, is always a good idea, but that's where the similarities end. Sure, the idea of pitching a tent and foraging for firewood to cook your own dinner as you reconnect with nature sounds great in theory, but TBH camping's one helluva tough gig. There's the sweltering 40-degree heat, blowing up your air mattress to the point of exhaustion, going days without a proper shower and waking up swollen from a mosquito's overnight feast. The realities of #camplyf are enough to have you trading your swaggie for The Sofitel in no time at all, and we almost wouldn't blame you. That's until glamping entered the holiday planning picture. Equal parts glam and camping, the modern-day variation bridges the Paris similarity gap with its best-of-both-worlds charm featuring a ridic proximity to nature minus the sacrifice of your favourite creature comforts i.e. actual beds vs. flat-as-a-pancake camp 'beds'. Enough of the DYO (Digging Your Own) dunny, and the PYO (Pitching Your Own) Tent. Why put yourself through the hassle, when it can already be done for you!? 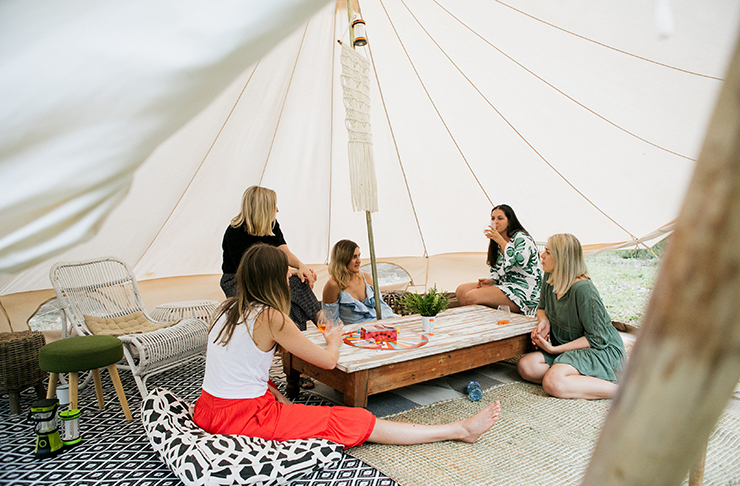 It's time to take a tip from us and hit 'bookmark' pronto as we have a feeling our guide to the best glamping on the Sunshine Coast is going to become your new BFF with the following gems. Lock in a trip to Rivershore Retreat and you'll be livin' it up on the banks of the Maroochy River in a safari tent fit-out with a king-size bed, kitchenette, bathroom, and TV for all the #netflixandchill you can handle (when you need a break from nature, that is). Throw a few snags on the Weber Q of the outdoor deck that's sizably on par with the tent, just the way we like it. For all your onsite fun times take a dip in one of several pools, swing your way through the mini golf circuit or unleash your inner child on the giant 20m x 9m trampoline as you brace for the tsunami sized onslaught of childhood memories that'll come flooding in. Remember the choose your own adventure series that stole hours of your childhood life? Pitch Luxury Camping basically sways a little that way. Choose your location, book your tent, pack your bags and let the Pitch team take care of the rest (aka the scary stuff). Based in Noosa but delivering glamp dreams as far south as Byron, your options are literally limitless. Let your imagination guide you into a vacay feat. BBQ breakfast with an entrée of sand between your toes, or delve into the bushlands for an evening soiree beneath the milky way. With the freedom to choose your campground locale, this one scores a giant tick (and lick) of your furbaby's approval - YAS! We could easily sum this one up for you in four words - fully equipped beachfront campsite - but we're gonna delve a little deeper because this north Queensland paradise has oh-so-much more to offer. It overlooks World Heritage Listed Fraser Island, for goodness sake - somebody pass us the Ventolin!! As you lose hours of your trip exploring the coloured sands of Carlo Sandblow and nearby Tin Can Bay, you'll effortlessly reward yourself and the environment with eco-friendly holidaying that's guaranteed to leave minimal footprint. We know you love the sound of that, so let's move straight to the next steps once you're done here; submit your annual leave and get packing! We're in lurveeee with Rainbow Beach Ultimate Camping. If it's absolute wilderness you're chasing, halt your search now because Elanda Point is the place for you. Located 25 minutes from Noosa and surrounded by 65 acres of natural bushland, don't be surprised when a mob of kangaroos rocks up for a morning cuppa Joe at your glampsite. Take a break in one of the modest Wilderness tents with shared restroom facilities, or hold out till April when the Paperbark tents are due to launch. Ensuite bathroom, private deck, continental breakfast - need we say more? Sometimes we all need a little temptation, by means of luxury, to enjoy the great outdoors, and when there's a complimentary shuttle to main-hub Noosa in the works, you know you gotta add Habitat to your weekender bucket list. 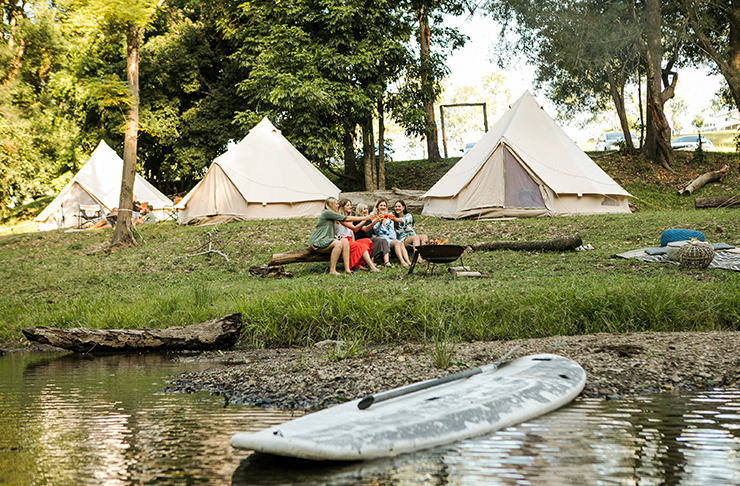 We had to include Habitat Noosa in our guide to the best glamping on the Sunshine Coast. 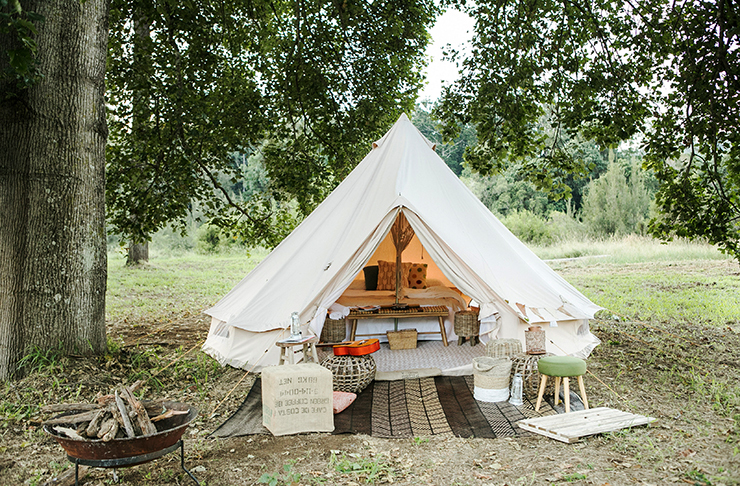 Okay, so you wanna give this glamping thing a go, but with minimal effort - we hear ya! You wanna put yourself in the middle of a paddock, bordered by trees with a lake for good measure, and this place MUST boast strong campfire capability. We aren't bluffin', but we think the answer lies in Kenilworth, at Bluff Creek Campground. We'd be calling on the guys at Pitch to set you up for the best middle-of-nowhere vibes within an hour's radius of Central Sunny Coast. Enjoy the swimming holes, bike tracks, and your safety net of nearby local cafes, because no matter where you are, a barista made coffee always tastes best, right? We're taking you wayyy north to Tropical North Queensland where you'll find Jabiru Safari Lodge hanging out within the Mareeba Wetlands. The 2000 hectares of savanna woodland, grassland and freshwater wetlands serves up the ideal sitcho to spy on the area's wildlife, and with the endangered species list on the rise, this is one getaway you'll wanna get happening ASAP. The all-inclusive tariff covers meals, activities and an African-styled safari tent that'll have you questioning whether you remembered to pack your passport. Stop scurrying through your luggage, we promise you're still on Aussie soil so kick back into a champagne sunset seshy on your deck (if you can resist the onsite jacuzzi, obvs.). If you're the type of person who enjoys a campsite with an ocean outlook (and who isn't), it's time to hit the bitumen highway to Agnes Waters Beach Holidays. Hugging the hillside, the Breakers safari tents are built upon raised timber decking to maximise the ocean views that are the icing on your city escape cake. The bliss will be so real as you explore the Agnes Waters-1770 coastline alternating between beachside yoga, surfing, fishing, or lazing about listening to waves crashing upon the shore. Your retirement plan may well have an extra option following a visit here, mark our word. 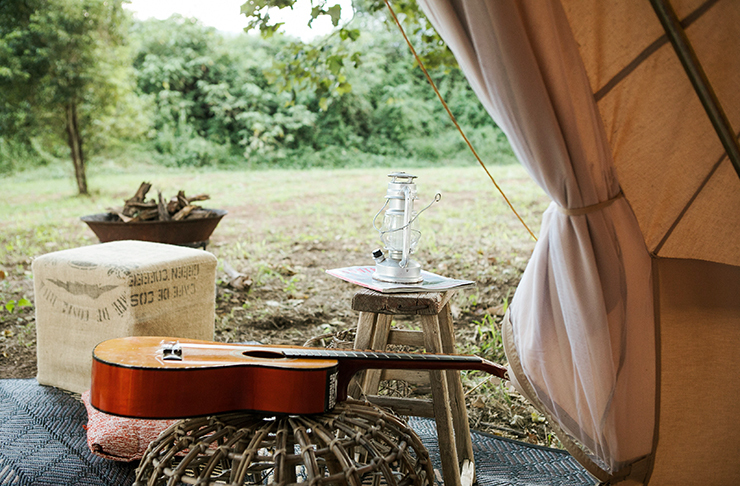 Feel like getting your glamp on, island style? Check out Stradbroke Island's latest glampig offering. Ok so you insist on camping? Here's Our Fave Camping Spots On The Sunny Coast. We've also got 7 Awesome Camping Spots Worth Driving South For.